From the beginning, this investigation was designed to be a qualitative look at how entrepreneurial journalism is taught in Latin America and Spain. To do this, we built a database of professors who teach entrepreneurial journalism courses or who incorporate entrepreneurial journalism skills into their courses. 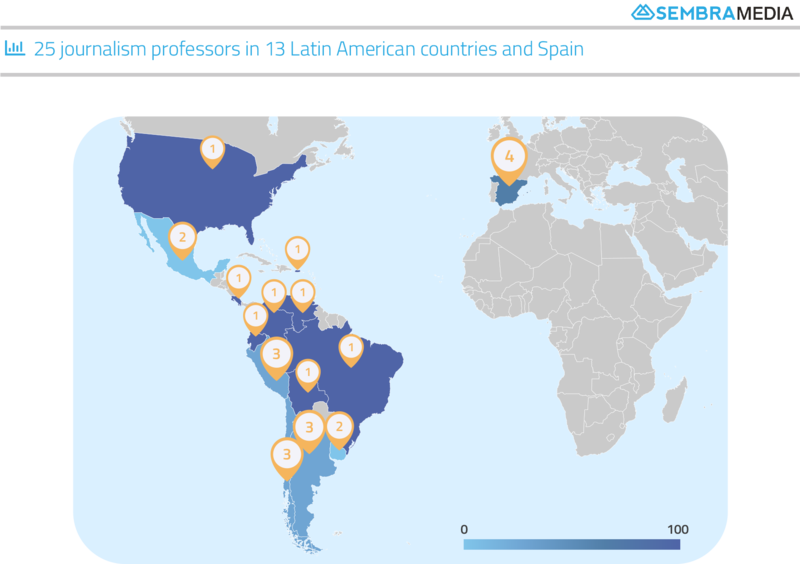 Finding these professors was possible thanks to the information shared by SembraMedia’s ambassador network (currently operating in 18 countries in Latin America, Spain, and the U.S. Hispanic market) and a direct search for higher education institutions that have communication or journalism schools. We designed a questionnaire to cover different aspects of teaching methodologies. Our initial database contained more than 40 teachers (and has since grown to 59), but we decided to do a maximum of 25 interviews so that there was sufficient time for each conversation to be in-depth. The first categorical distinction we made was between professors and trainers who lead workshops. When we use the term “professor” in this report, we are referring to instructors who teach material which is part of an established course of study. The professors included in this study have an ongoing teaching relationship at an academic institution, whether or not they are part of the permanent faculty. These professors also usually live in the country in which they teach. Trainers operate with a different model: their courses may be outside of the curriculum (rather than integrated into required courses), they tend to be globetrotters, and they don’t necessarily live in the country of the institution at which they teach. Their “nomadism” puts these trainers and their workshops into a separate category which deserves to be studied in a future research project. We attempted to make sure that there was balance as well as diversity in this study. First, regarding gender balance, 56% of those interviewed were female. The second area in which we wanted to maintain balance was the geographic distribution of the professors interviewed. In Spain, we identified almost a dozen professors, but in other countries the list of potential interviewees was much shorter. For this reason, we established a limit of four teachers per country with the intention of including at least one person from Central America and one from the Caribbean. The final list was dominated by Spain with four professors; followed by Argentina, Peru, and Chile, with three apiece; Uruguay and Mexico with two; and Bolivia, Brazil, Colombia, Costa Rica, Ecuador, Puerto Rico, the United States, and Venezuela with one professor each. According to the "Map of training centers and programs of communicators and journalists in Latin America and the Caribbean" published by UNESCO, in 2009 in Latin America, there were more than 1,700 schools and universities teaching journalism. 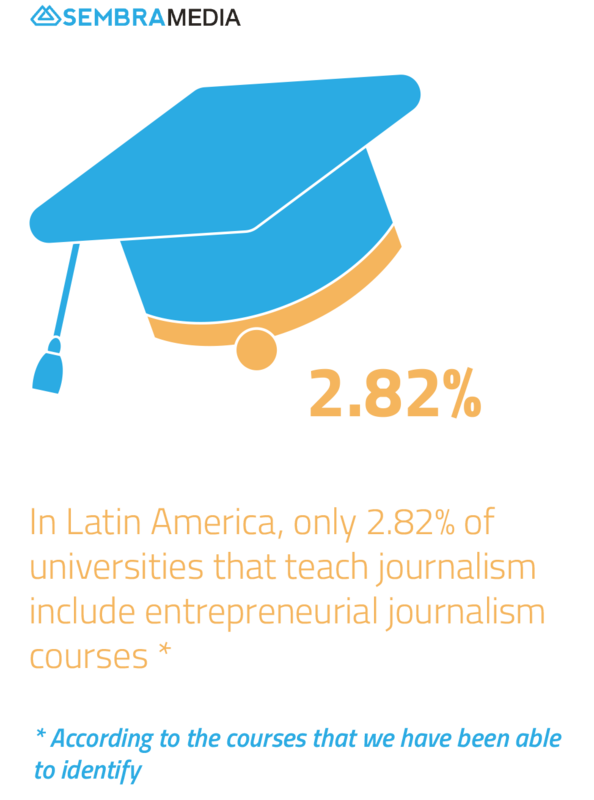 We have identified 48 Latin American universities which offer entrepreneurial journalism courses, which means that only 2.82% of universities that provide communications courses in Latin America offer this subject. We are aware that this study includes only a sampling of the total number of teachers of entrepreneurial journalism at universities, which is why we think there is much opportunity for research and development of more of these kinds of courses. Spain, meanwhile, has a much more developed academic ecosystem, with its own characteristics worthy of further study. According to the article, "How do we study communication in Spain?" by Ángel Carrasco-Campos, Enric Saperas, and Manuel Martínez-Nicolás, in 2015 there were 54 universities that offered a degree in communications in Spain. The 11 Spanish teachers in our database represent 20.3% of that total, a percentage that - compared to the Latin American percentage - reflects its robustness. The majority of the interviews were conducted virtually and SurveyMonkey was only used to enter and organize the data collected. Additional materials, including published academic research and links to media projects created by students based on what they learned from these courses, was gathered during follow-up interviews and meetings.